Come discover the Sheraton Suites Galleria - Atlanta. Just across from the Cobb Galleria Centre and adjacent to the Cumberland Mall, we are a great choice for your next business or leisure trip. The Performing Arts Center and numerous dining options are nearby. Our convenient location is also a short 15-minute drive from downtown Atlanta and its major attractions, including Georgia Aquarium, the World of Coca-Cola, CNN Center, and Six Flags Over Georgia. Complimentary shuttle service is available within a three-mile radius of our hotel.Feel right at home in the sumptuous Sheraton Signature Sleep Experience featuring a pillow-top mattress, ultra-soft duvet, and crisp white sheets. In addition, enjoy complimentary High Speed Internet Access at computer workstations in our lobby. Enjoy an invigorating swim in our pool or re-energize at the state-of-the-art Sheraton Fitness.Let our staff of catering professionals plan your ideal event. We offer 4,000 square feet of flexible meeting space, including our elegant Cumberland Ballroom. From a small business meeting to a special wedding reception, our facilities can welcome up to 250 attendees.Enjoy warm and welcoming service at our all-suite hotel the Sheraton Suites Galleria-Atlanta. 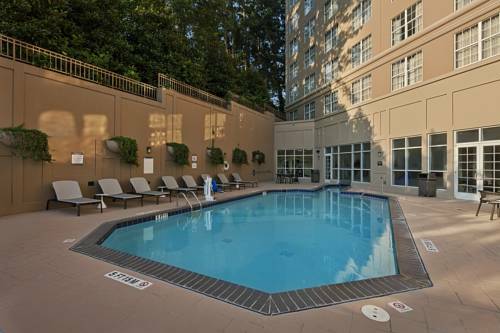 You'll love our location - adjacent to the Cumberland Mall, Cobb Galleria Centre, and a short 15 minute drive away from downtown Atlanta and its major attractions including the world's largest aquarium - the new Georgia Aquarium. The front desk is also happy to provide directions to Atlanta's new retail and entertainment district - Atlantic Station, Six Flags Over Georgia, Underground Atlanta, White Water American Adventure, and the many sports venues that Atlanta has to offer. - ADP - Automatic Data Processing, Inc.